(Jan. 8, 2019) -- As 2019 begins, UTSA is preparing to welcome 32,000-plus students for the spring semester. This year, which marks the university’s 50th anniversary, students will have some extra activities on campus as they return from winter break. For the first time, UTSA will be hosting Roadrunner Days in January. Traditionally, Roadrunner Days are held in August, at the beginning of the fall semester. 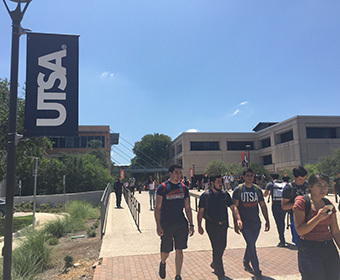 They are designed to prepare Roadrunners for the new academic year and help connect them to the UTSA community. Now, students will get the same opportunity at the start of the spring semester. During Spring Roadrunner Days, which goes from Jan. 11 through Jan. 26, students can explore more than two dozen activities that reinforce student success, student involvement and community service. More than 3,800 students living on campus will return to their residence halls and get their home away from home ready for the spring semester. Students with their UTSA ID can get in free to see the Roadrunners take on the Mean Green. On the first day of classes, students, faculty, staff, alumni and friends are encouraged to wear their favorite UTSA gear to show their Roadrunner spirit. Dozens of UTSA departments hosting information tables will line the heart of campus with details on UTSA’s 50th celebration plans and other ways to get pumped for the spring semester. The Tomás Rivera Center and UTSA Library will showcase student support services during informal come-and-go sessions. Representatives from Campus Recreation, UTSA Student Health Services and Counseling Services and Dining Services will help students stay healthy – physically and mentally – to get the most out of their UTSA career. Cheer on the Women’s Hoops as they host the Blue Raiders. Remember, students who bring their UTSA ID get in free. Celebrate the end of the first week of classes with the entire UTSA community during this social hosted by the Student Center for Community Engagement and Inclusion. The event is a terrific opportunity to celebrate the diverse identities of Roadrunners, meet students, faculty and staff, and connect to services, resources and organizations on campus. A light lunch also will be served. The UCinema spring season launches with free screenings of the movie Selma. Join fellow Roadrunners as they share their UTSA spirit before the Women’s Basketball game tips off. Put on your orange and blue and grab your pom poms for this conference battle on the court. In case you missed it, enjoy another screening of the film that’s a powerful selection as we mark Martin Luther King, Jr. Day and prepare for Monday’s march. Classes will not be held in observance of Martin Luther King, Jr. Day. UTSA students, faculty and staff are invited to join San Antonio’s annual Martin Luther King, Jr. March, the largest in the country. Buses will be available at the Main and Downtown Campuses to take Roadrunners to the march. Grab a friend and learn about the many ways to get involved on campus. Stop by and learn from fellow Roadrunners how to help in the community. The reception marks the opening of Shades of Brown, an exhibit by renowned artist and UTSA alumnus Kaldric Dow ’13. Students at the Downtown Campus can learn ways to make a difference and get involved. Local musician Christine Su kicks off the monthly series with live music to entertain the UTSA community. Join the Union Leisure Arts class and learn the basics of hand-knitting. Wear your new knitted scarf and walk over to the Convocation Center to catch the UTSA men’s basketball team take on a conference foe. Grab a friend and catch a free screening at one of two showings of this Marvel superhero movie. Here’s another chance to show your Roadrunner pride and cheer on the men’s basketball team to victory. Wrap up Roadrunner Days with an encore showing of Venom. Learn more about UTSA Roadrunner Days: Spring Edition.